Yesterdays Jewels is listed in Ann Pitman's books, Inside the Jewelry Box, Volume 2 and Volume 3!. *************************** We offer Free Insurance on ALL items at this site! Click links below to read articles. 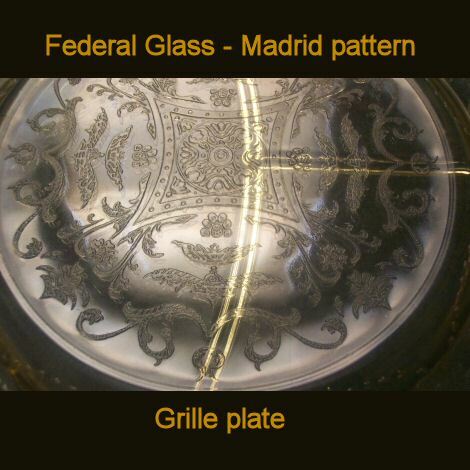 Federal Glass Madrid Amber Grille Plate, measuring 10 1/2". Manufactured between 1932 and 1939. There is a tiny chip on one edge, which would probably hide neatly behind your shelf's plate rack. Otherwise, it is in wonderful condition. A lovely piece of depression glass for your collection. We will accept your offer whenever possible, or respond with our best counter offer, depending on our initial costs. Please note that additional discounts are not valid with offers. 1. Email us with your order. Include your name, address and phone number, the product name, item number, and price. We will email you an invoice and our mailing information. 2. Or, call us at 610-867-3885 and leave a message. We will get back to you promptly. 3. Or, add your items to your cart and create a secure password account on our login page when you checkout (your password will be encrypted by our security certificate and only you will have access to it). Whichever method you prefer, we are ready to serve you! We accept Paypal, U.S. and International money orders, and bank checks from our U.S. customers. Please contact us if you have any questions. To receive product notifications or our WEEKLY UPDATE newsletters, create a secure password account or email us to request to be put on our email list. Please enjoy your visit, and thank you for shopping at Yesterdays Jewels!